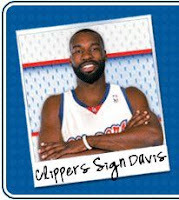 Congrats to the Clippers on the B.Davis signing. Check out this video clip below. It sums up all of my blog postings today. Skating & New Edition...isn't it ironic. This video is totally new to me. Reebok Entertainment presents: Baron Davis in "One Shot". Thanks Kasey!